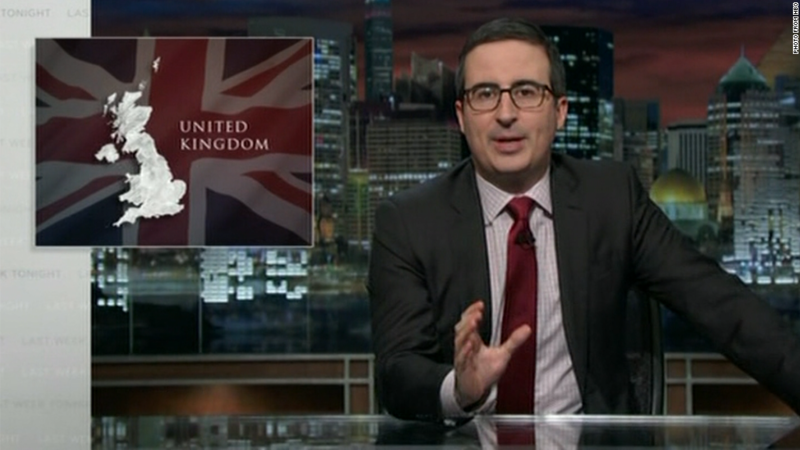 British-born John Oliver is extremely unhappy with voters in his native country. One week after delivering a hilarious and profane plea to his countrymen to vote against Brexit, a frustrated Oliver returned to the subject during his show on Sunday night. "Let us begin straightaway with the United Kingdom, a place whose very name, after this week's events, is beginning to sound a bit sarcastic," quipped Oliver. "And the fallout in Britain has been swift and significant." The late-night comedian proceeded to take viewers on a tour of the significant challenges facing Britain in the wake of its choice to leave the EU. (Oliver's "Last Week Tonight" airs on HBO, which is owned by CNNMoney's parent company, Time Warner (TWX)). "It seems like whoever the next U.K. prime minister is going to be, whether it's Boris Johnson or a racist tea kettle, they are going to be in for a rough few years," he said. Oliver said the Brexit vote even prevented him from taking too much pleasure in the resignation of Prime Minister David Cameron, an event he would normally enjoy. "David Cameron announced he would be stepping down in the wake of the vote, which should make me happy, but in this situation, it doesn't," he said. "It's like catching an ice cream cone out of the air because a child was hit by a car. I mean, I'll eat it, I'll eat it -- but it's tainted somehow." Politicians who argued in favor of Brexit did not escape Oliver's wrath. In particular, he took issue with those who described the vote as Britain's "Independence Day." "First of all, Britain was already independent. In fact, it's what many other countries celebrate their independence from," said Oliver. "And second, the sequel to the movie [Independence Day] actually opened this week, and features the wholesale destruction of London, which is beginning to feel pretty f------ appropriate right now." Turning his attention to the U.S. presidential election, Oliver said the Brexit vote could be seen as a warning to Americans who are considering voting for Donald Trump. "You might think, that is not going to happen to us in America," he said. "Well, let Britain tell you: It can happen, and when it does, there are no f------ do-overs."